The change in the calendar year signals to many homeowners that it’s time to make renovations to their home or finally start those DIY projects they’ve been meaning to complete. Whether it’s a fresh coat of paint in your guest bathroom, a complete kitchen makeover or just adding a few new décor pieces around the house—change feels good, especially at the beginning of the year. We spoke to Lee Crowder, Design Gallery and Model Home Branding Manager for Taylor Morrison and Darling Homes in Houston and Dallas, and Brittany Wightman, Charlotte Design Consultant, about the trends they’re each seeing in their neck of the woods and they both had a lot to share on how to bring your home into the new year! “One trend we’re seeing is a shift toward becoming eco-friendlier and bringing healthy lifestyles straight into our homes,” shared Lee Crowder. “While there are a lot of different ways to achieve this look, one must-have is an abundance of plants. Bringing touches from the outdoors inside is not only an aesthetic choice, but real plants also provide the benefit of filtering the harmful chemicals out of your home.” Crowder also suggests opting for natural materials over manmade, ditching dirt- and dust-trapping carpet for hardwood and swapping high-gloss paint for flat finishes—they have fewer harmful chemicals. 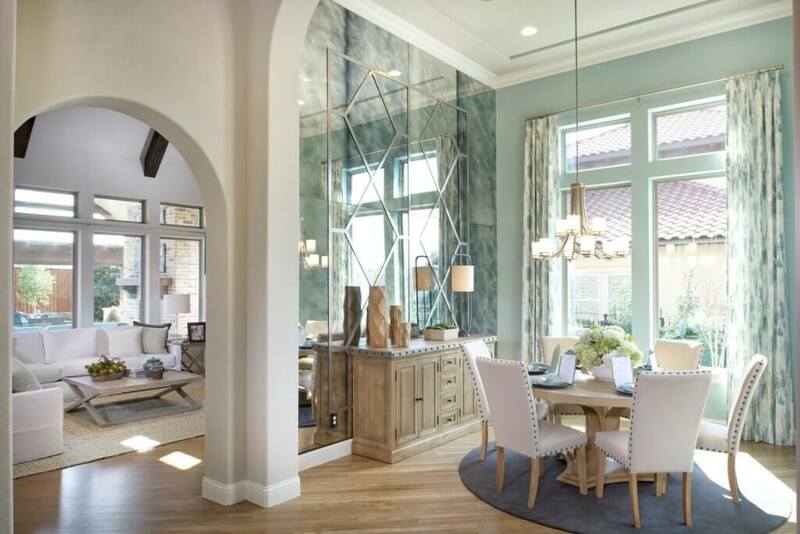 With many homeowners opting for an indoor-outdoor lifestyle, Wightman shared that incorporating earth tones in your home is an easy way to bring the outdoors in. High-contrast, monochromatic looks are rising in popularity, especially in the kitchen. “Pairing dark finishes with stark white or grey cabinets will be a very popular look in the new year,” said Wightman. Fun hardware finishes like black, rose gold and brass continue to gain popularity. “Black is a really important color for 2019 and you’ll be seeing it pop up everywhere—from countertops to hardware and faucets,” said Crowder. Also inspired by fashion runways is the Danish hygge look. Comfortable, relaxed items like cozy and soft rugs, sofas and beds are replacing the stark, tailored look. “Taylor Morrison homebuyers are investing a bit more into their larger purchases in order to ensure quality and comfort. I like to say—buy once, cry once,” said Crowder. There you have it—19 design ideas to inspire you for 2019! Which trend is your favorite and are you planning any fun renovation/DIY projects in the new year?